You must have Adobe Acrobat Reader to view this e-book, and Web TV is NOT supported. Available in paperback too. Click here to purchase The Desperate Genealogist's Idea Book as a paperback book for only $24.95. Plus, your purchase will go to the support and operating costs of DeadFred.com, a FREE site that is accessible to you anytime when you are wanting to return orphaned photos or are trying to track down images of your own long-lost relatives. You can always count on DeadFred.com when you need a place to conduct unlimited photobase searches, join discussion groups, search school annual photos and even manage your own photo records. With over 667 reported photo reunions to date, DeadFred.com intends on growing its database that is already over 56,000 records strong and staying one of genealogists' favorite online destinations. Your one-time purchase will help these intentions come to fruition! Thank you in advance! Finally! 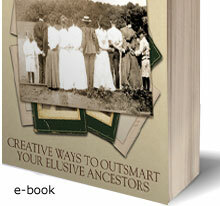 The Desperate Genealogist's Idea Book: Creative Ways to Outsmart Your Elusive Ancestors is available for purchase. A tag-team effort by DeadFred.com and some of genealogy's top ancestral sleuths and accomplished writers, this 150-page e-book is packed with articles and case studies that reveal invaluable tips, shortcuts, resources and even step-by-step instructions on how to use overlooked research tools, conduct specialized searches and tackle brick walls with sheer ingenuity. When you're feeling like a "desperate genealogist," you'll be able to consult our e-book time and again for tried-and-true pearls of wisdom from our contributors. Find out how a woman concluded a two-year search for an elusive female ancestor on page 22. Discover how to find clues about your ancestors by broadcasting on the Internet on pages 39 and 126. Learn the winning 10-point formula for successful genealogy research on pages 44-46. Receive insights on tracing slave ancestors on pages 63-68. Figure out how to demystify mystery photographs by examining aspect ratio and deciphering what type of camera was used to take the photograph with a Camera Comparison Table available on page 78. Read step-by-step how to find U.S. passport applications in the LDS Library Catalog on pages 94-95. Enrich your research findings by getting to know your ancestors' neighbors using the advice found on pages 107-118. Get the mileage you need out of Family History Centers to achieve your research objectives by reading the information on pages 69-72 and 97-105. Study the vocabulary that is essential for preserving your family history documents on pages 137-143. And...that's just a sneak peek! Click here to buy your copy today for $14.95 USD per download, and reap the benefits from learning from the best of the best! You'll receive the creativity and the advice that can only come from over 90 years of combined genealogy research experience in one MUST-HAVE e-book. Would you rather have a paperback book? Click here to purchase The Desperate Genealogist's Idea Book in paperback format for only $24.95.